Raise your hand if you have decorated your valentine mantel or some area of your house only to have members of your household tell you it’s pretty ordinary? Did you see my hand go up? That’s what they said in not so many words. 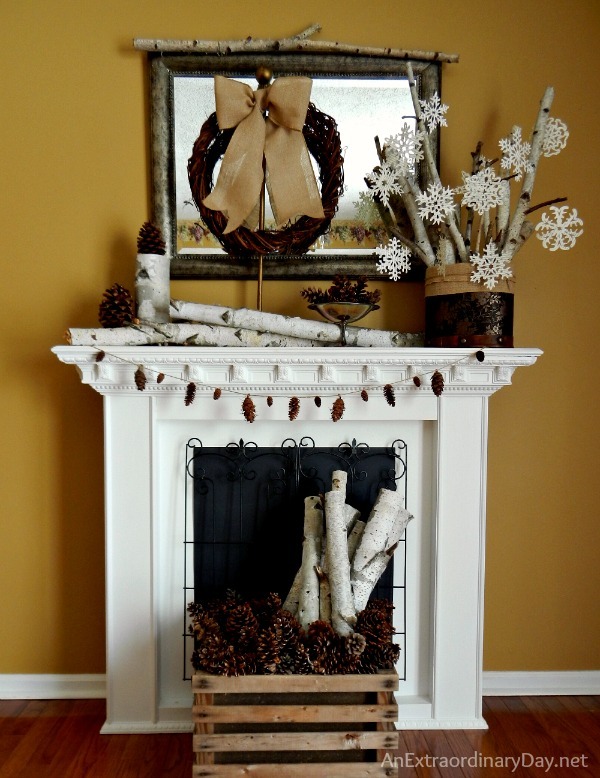 Remember my winter birch branch mantel with the hand cut book page snowflakes? I liked that “mantelscape.” It was different. And it seems that since it’s being featured a few places, some of you like it too. Why not tweak it just a bit for Valentine’s Day? The snowflakes were changed out for dangling book page hearts. A pair of letters were added to the mix, some small birch stumps and pine cones were taken out of the mix, and it was nice and simple and monochromatic. That’s true, if you are expecting to see some red. You see, I had decided that if I would just give a nod to Valentine’s Day and we would be good. I would love it…everybody in the house would love it…and you would love it. Good thing someone woke me up. 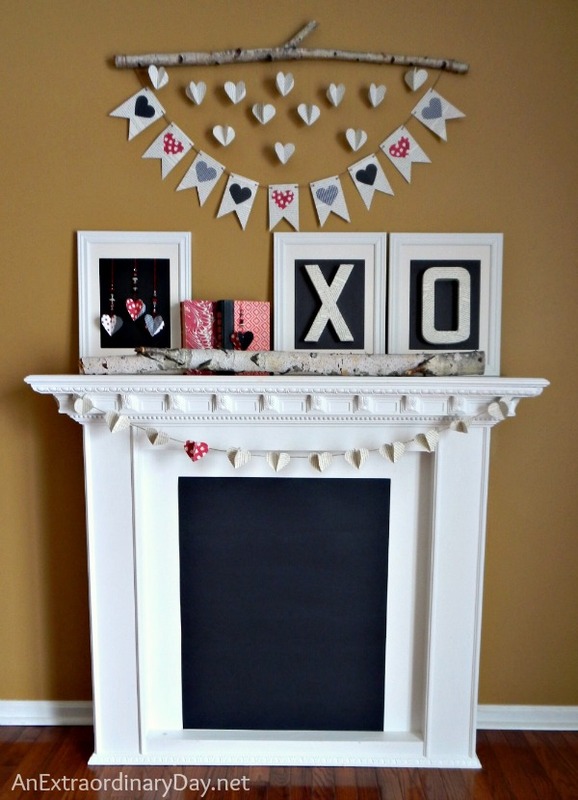 Because really….this valentine mantel is much more whimsical and fun. And we all need a little more fun, don’t we? I got out another book and started ripping out pages and slicing them with the paper cuter, and punching out hearts, to make pennant banners and garlands. Some frames sitting in the corner of the craft room had their glass replaced with polka-dotted scrapbook paper to which I hot glued my Mod Podged book page letters for a little bit of fun. 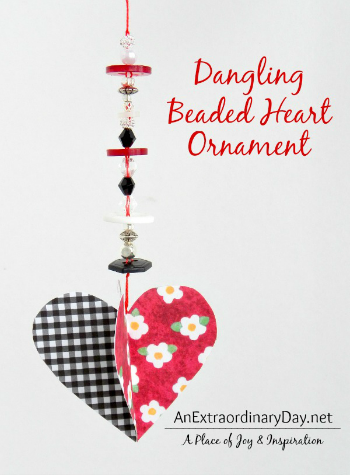 Recently I did a guest post and had these very fun dangling hearts waiting to do something fun and different, so I framed a few of them and used another as a book marker. 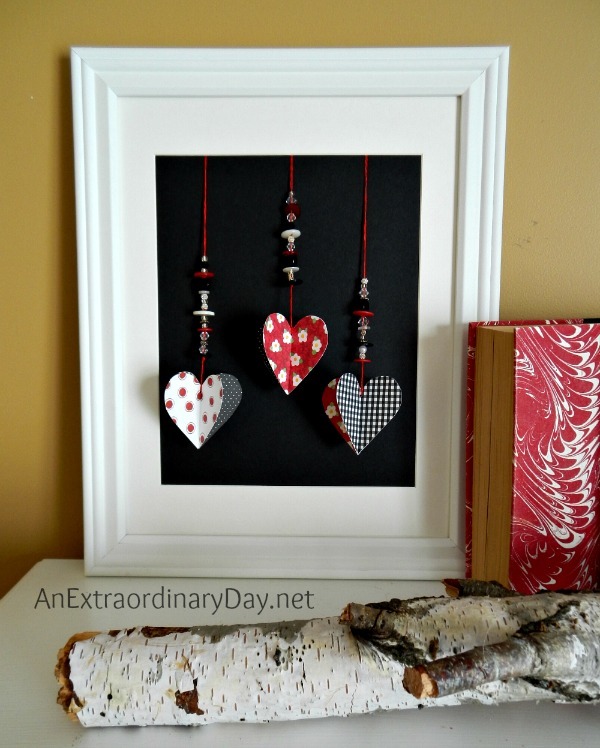 And for more fun and whimsy, I hung a birch branch and dangled book page hearts. Do you remember this joke from when you were a little kid? “What’s black and white and read all over?” The newspaper. That became the theme for our valentine mantel. Actually, book pages rather than newspaper, but it works. Yes? Now that everybody is happy with the new valentine mantel, I’ll give you another little back story. Recently I was in the store to pick up cat litter for my favorite felines. As I was making my way to the back of the store, I walked past an end cap with some clearance items. 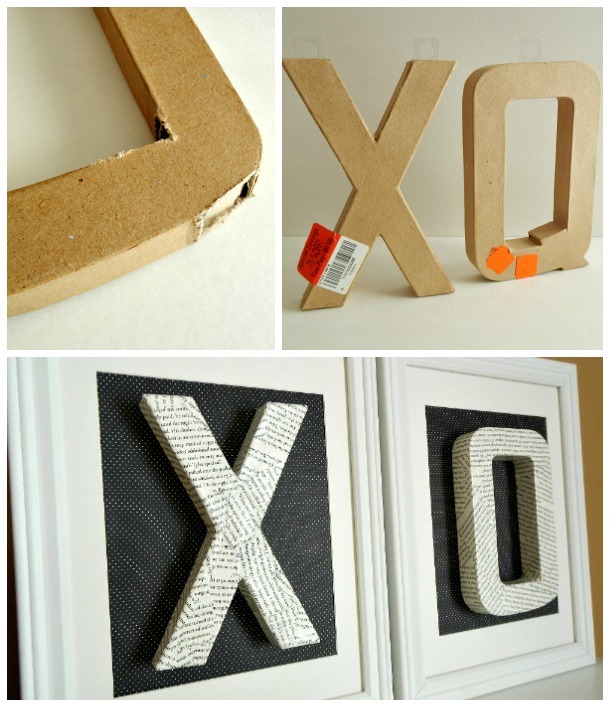 My eagle eye spied some cardboard letters. What could I do with an “X” or “8” or “7” or “Q”? Hmmmm. If you look closely, you’ll see that Miss “O’s” bottom corner is not perfectly round. At one time, I would not have been able to live with that. But, now…I just remember that the Nester says, “It doesn’t have to be perfect to be beautiful.” So although my “O” isn’t perfect….she’s looks beautiful gracing my valentine mantel and does a good job of reminding us that we each need more hugs every day. 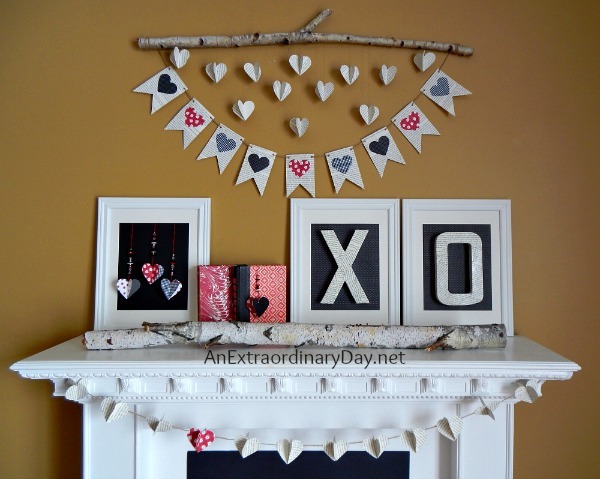 A fun and whimsical valentine mantel. Thank you so much Julia!! I too LOVE book page crafts and decor. Don’t let the lack of an official mantel stop you. The one I decorate on now is a faux fireplace. Actually any flat surface…other than your dining or kitchen table can serve as a mantel. Give it a shot and have fun playing and creating a vignette. It’ll make you heart smile. I think maybe decorating for spring and Easter early is a good thing this year!!! Thanks Deborah! Every bit of it was super easy to do. The banner just took a few minutes. The heart garland, longer because of the gluing, and of course, beading takes the most time for me, you’re a pro. Have fun with it. Oh my, this mantle is one of my favorites I have EVER seen! I especially love the branch with things hanging down. It immediately caught my eye…. 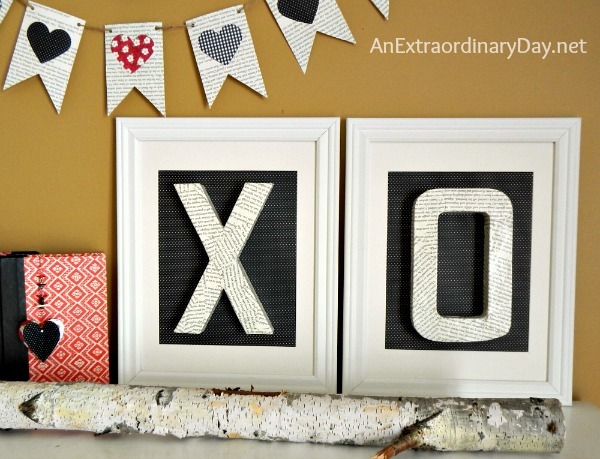 Awww Sarah….I don’t think there are any valentine mantel police around…so I think you’re safe. 😉 Have fun getting creative for St. Paddy’s Day!! This one’s adorable. But bless the folks who thought they could give their opinion (if even in a ’round about way) and not have the roof fall in. Quite gracious of you to go back to the task and create a bit more whimsy……and have FUN while you were doing it. Whimsy is a good word. Made me smile, that one red heart on the banner and the little flags with hearts overhead. Obviously I won’t have the time to whip this up before tomorrow. But I can store the idea away for another time. Of course I say that and then fail to make the time to actually create. Oh, but maybe for the coffee nook! *laughing* I can add it to the list. I love the look of the mantle. I think it has just enough Valentine’s Day flare without going overboard. That’s so nice of you to say that, Erlene. Thank you!!!! 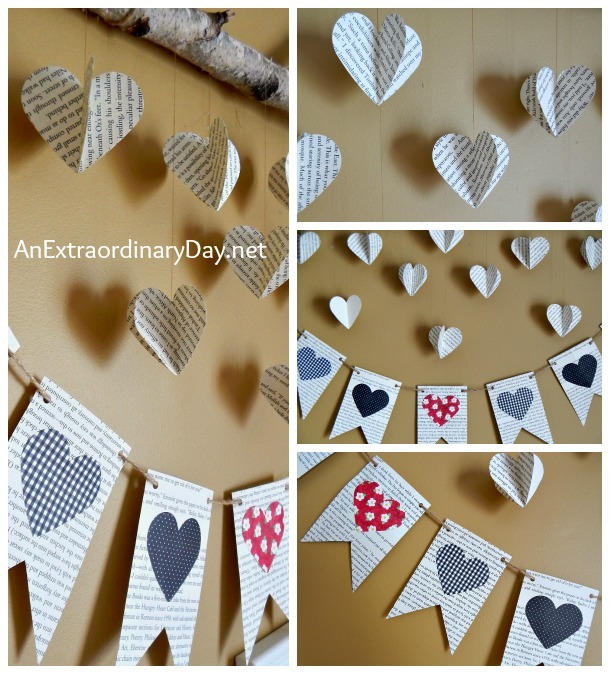 Your entire book page decor is gorgeous! This is such a cute idea and I love how it looks! I am going to pin this as an inspiration for next year! Thanks for sharing at TTF! Both mantle decors are great! I do love the V-day one best! Thanks Heather! I agree…the winter one is just so wintry. Haha! Dark like the season. I’m ready for sunshine and happiness! Hurry Spring!! Thanks Melanie!! I’ll be right over!! This is so sweet! 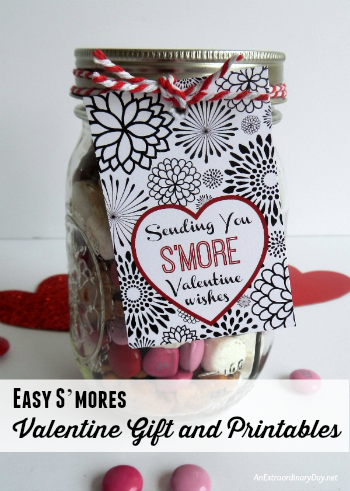 I’d love it you would share it on my new link party DIY:Done! at FlyingC-diy.com. The party is open through Sunday, and every weekend, I hope to see you there! And thanks for the invite too! Hi Diane! Your mantel looks absolutely gorgeous and I’d be hard pressed to say which of these beautiful projects is my favorite – I love them all! 🙂 Thank you so much for joining us and sharing at Best of the Weekend! Hope you have a happy and wonderful week! Hope your new week is simply Extraordinary!! This is really pretty. I love making things out of book pages and paper too. Thank you Carmody! I don’t know what it is about book page and paper…but playing with them makes my heart happy. Hope your week is filled with extraordinary happiness, too! 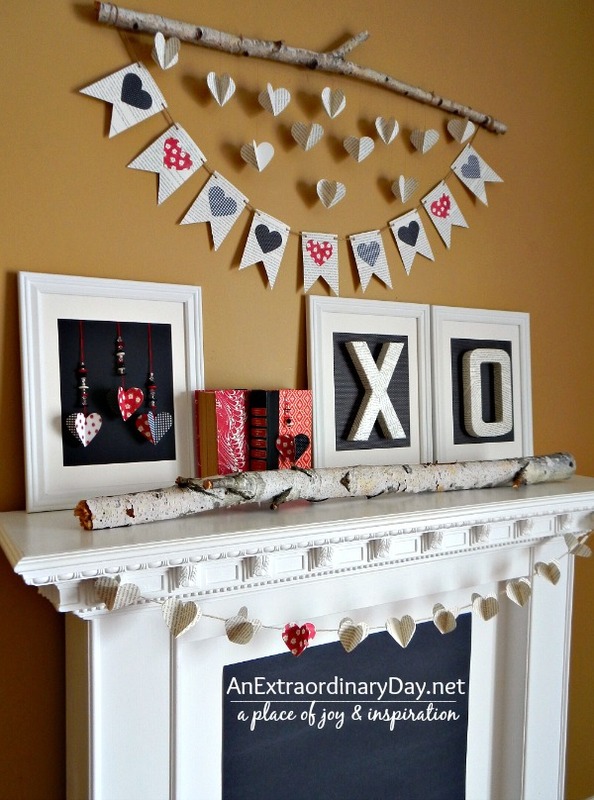 What a cute mantel- so creative! The paper hearts and banner are my favorite parts! Your sweet thoughts make my day! Wishing you An Extraordinary Day, Bev! 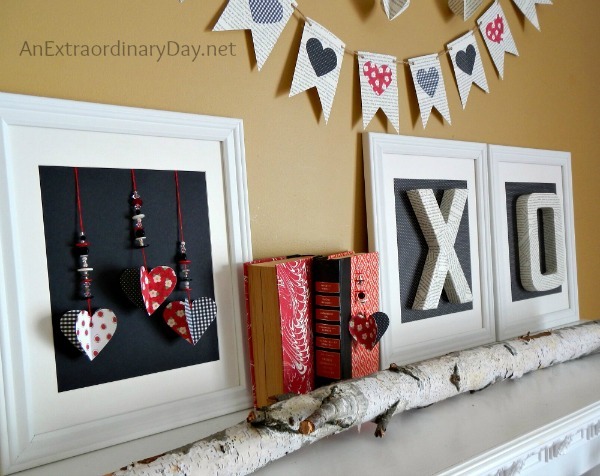 I love the idea of using book pages, your mantel looks great! 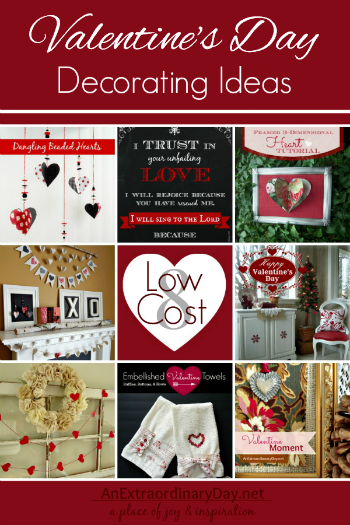 Thanks for sharing them with us at Sewlicious Home Decor! Pinned! I love your mantel!! Using that branch to hang the banner on is so clever!! Your winter mantel was gorgeous too!! Have a great day! This makes me wish I had a mantel!! Thanks for hosting and popping by with your warm thought! !